The DD Nest Hammock is covered head-to-toe in our own DD Multicam pattern, designed to make sure you blend in perfectly to woodland environments. This hammock ensures the most covert campsite possible, whilst keeping all the time-tested comfort and features that a DD Hammock provides. Fully featured for covert camping. With a similar design to our highly-regarded Frontline Hammock, the Nest Hammock swaps the integrated mosquito net for a full DD Multicam top cover; offering a spacious shelter from wind and insects, as well as any prying eyes. A fine-mesh window at the head end of the hammock gives a good outward view without compromising the camo-capabilities! Dual, breathable base layers keep things comfortable in warmer climates, whilst insulation such as a DD Inflatable Mat can be inserted between the layers in the chillier months. The DD Nest Hammock comes with 10m of suspension webbing pre-fitted, whilst 4 internal pouch pockets allow for easy storage of essentials and valuables. Want to lie in the open air? 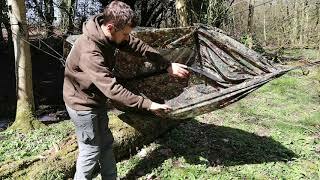 Just roll up the top cover and suspend it on the spreader poles above, or just remove the spreader poles entirely and flip the entire hammock over! Fully cloaked in DD's own Multicam Camouflage pattern - a versatile and complex pattern that blends in seamlessly to a multitude of natural surroundings. 4 internal pockets to store small valuables - these can be used in any hammock set-up configuration! All season insulation for your hammock - now in our Multicam pattern! DD Multicam version of the DD Jura 2 hammock sleeping bag.